No, really. I mean it. 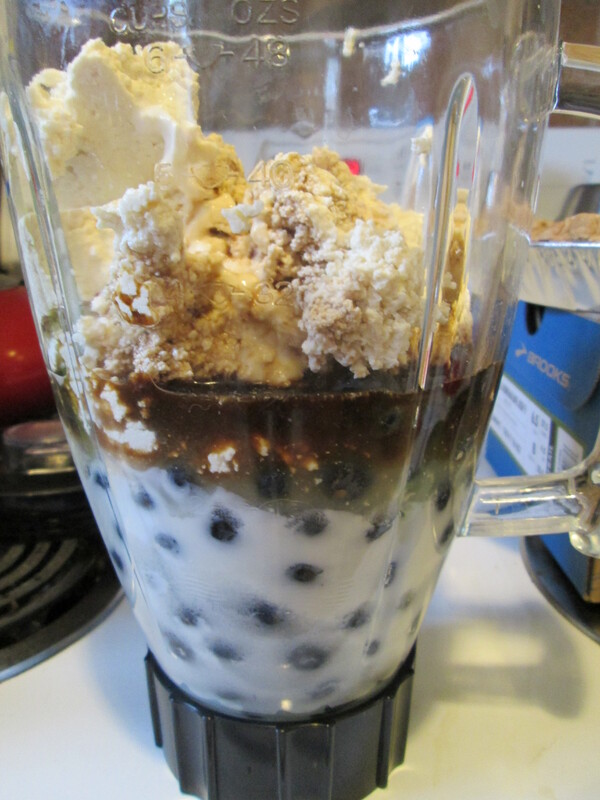 No bake blueberry pie. With tofu. I scrunched my nose up at first, too. Tofu is NOT my thing. But, it got my attention; I became intrigued. It has a few of my kitchen requirements: minimal ingredients, and minimal time spent in the kitchen. PLUS it’s a no bake concoction. And that’s even better. With the mixture of very interesting ingredients, I decided I just had to try it out for myself! I figured I’d be like a healthy, vegetarian, red-headed Betty Crocker. Onward to the grocery store. For those of you who know me, you know that I HATE the grocery store. Everything about it. Couldn’t tell you why, either. I avoid it at all costs; my food supply gets ridiculously low before I decide that a breakfast of condiments isn’t going to do it and I give in to the Evil Food Fortress (aka the grocery store). My goal, if I have to go to the store, is to spend as little time as humanly possible there. I try to pretend I’m a contestant on Supermarket Sweep and have a time limit to grab anything I need. This often results in forgetting items, and running in to things. Or people. I decided to go to a bigger store than I normally do, because I figured they would have a better selection of everything. For a blueberry pie, I needed blueberries. Not a problem. Unless you’re me. I’m calm, cool, and collected, circling the produce section again, and again. And again. There are zero blueberries to be found. I very nicely ask a gentleman stocking fruit if they have blueberries. My immediate, non-censored reply would have been: “If I wanted blackberries, I would have asked you for those! In fact, I wouldn’t even have to talk to you at all because I would have found them on my own in the first place!” But instead, I politely said: “No, thank you.” And walked away. Next stop: tofu land. I have never in my life bought any sort of tofu. Ever. I’m not a fan of the texture or anything about it. It’s a block of something that tastes like nothing. And that’s just wrong. The recipe calls for ‘Lite Firm Tofu.’ Easy enough. I finally find the tofu selection and search through them. I see ‘Soft,’ ‘Firm,’ and ‘Extra Firm.’ Those are my options. Wtf. At this point, I’m thinking of canning the entire thing, throwing a tantrum, and going home. I talk myself out if it, though, and sit there staring at the tofu for a good 5 minutes. I have zero idea which one to get. So I start poking them to see how ‘soft,’ ‘firm,’ and ‘extra firm’ they really are -like I really know what I’m doing-. That is until I catch a lady in the yogurt section next to me trying not to stare. I opt for the ‘soft’ one and head on my way to find Kefir. I have no idea what Kefir is, but the recipe calls for it. I try to find it on my own for a while. Remember, more time spent in the grocery store is time that I’ll never get back. I find an older gentleman who works there and ask him. He has no idea. Perfect. We find someone else, and she thinks she may know what it is but calls someone on the intercom anyway. And then there were 4. This guy knew where it was and starts leading us there….right back to the tofu section. It, of course, was sitting right there. It’s a probiotic drink in case you’re interested. The bright side is that I had everything else I needed for the pie at home, so I could get the heck out of there. 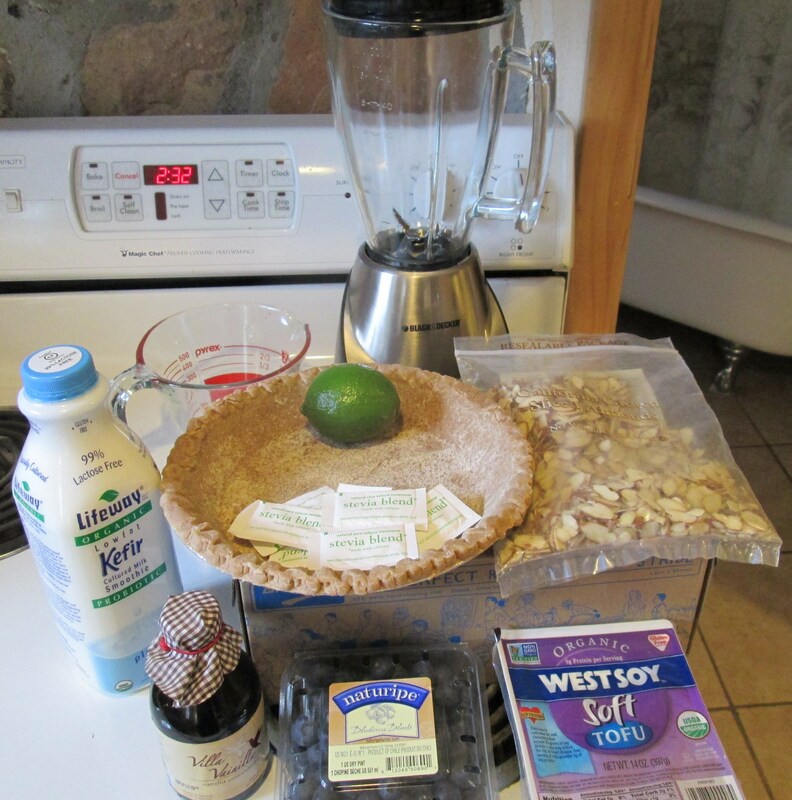 Ingredients: blueberries, tofu, kefir, lime juice, stevia, sliced almonds, vanilla extract, vanilla whey protein powder (not pictured), and pie crust. For specifics, this is where I got the recipe. Measure it all out, throw it into the blender, blend, and pour into pie crust. Easy as…well, you know. -sidenote- I had no idea tofu is kept in water (or something liquidy) to preserve it. I had tofu water everywhere in my kitchen when I tried to open it up. Gross. I topped mine with sliced almonds. 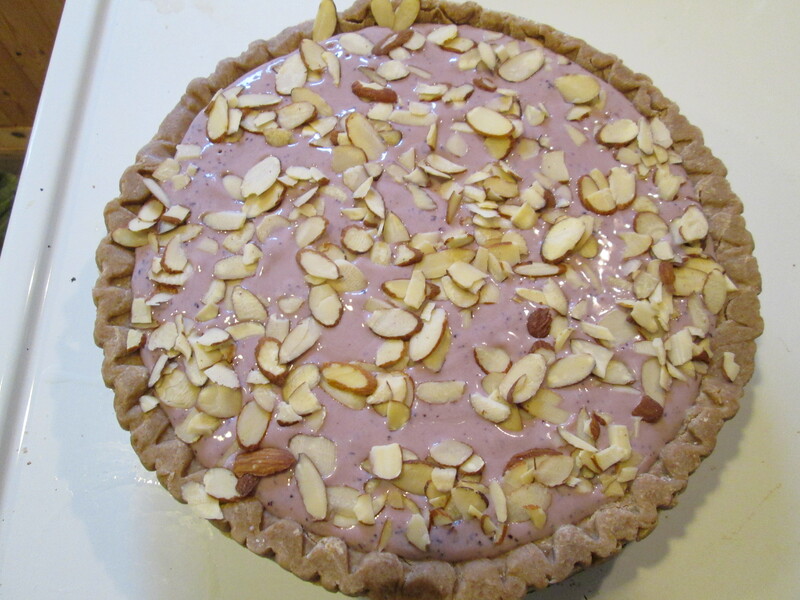 There is an almond crust recipe, but I just bought a pie crust instead. It needs to sit in the refrigerator for at least 4 hours before serving. I have to say, I was pleasantly surprised. The pie is delicious. I got confirmation from 3 other people as well that they liked it. No, it does not have the consistency of tofu. In fact, you can’t even tell. 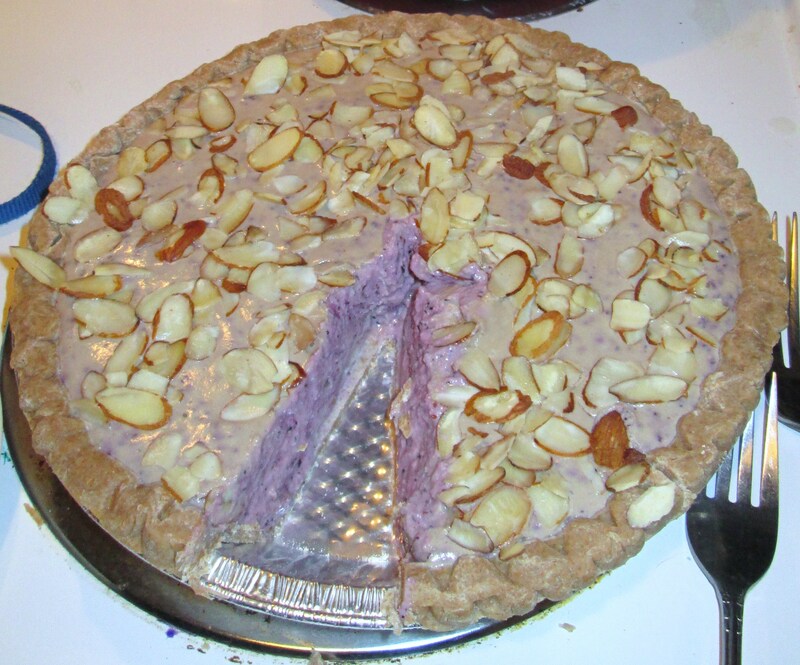 The pie could essentially be made with any sort of fruit or fruit combination. I might play around with the recipe next time I make it. 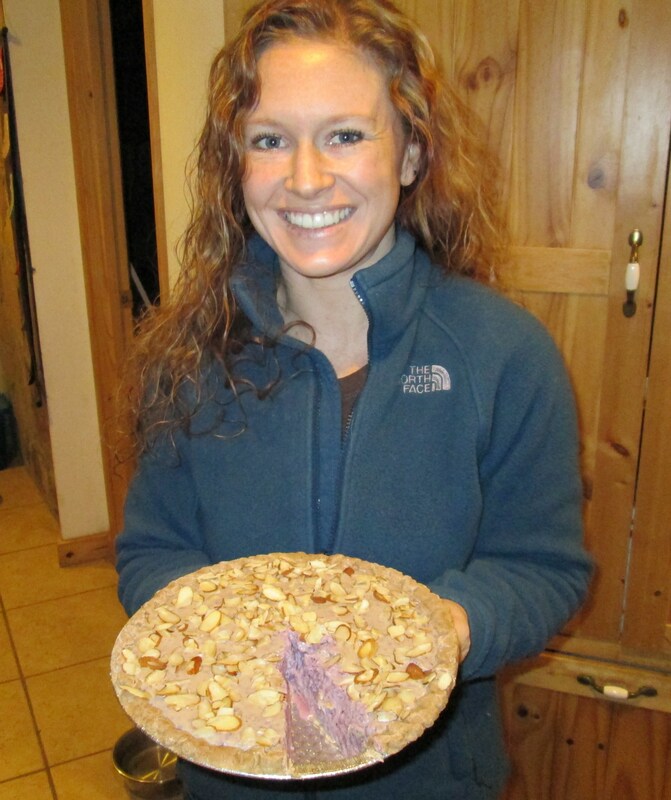 After the first slice, I put it in the freezer, and it came out almost like an ice cream pie. I liked it better than just the refrigerated one and will probably do this in the future. Combining a bad grocery store trip with tofu inspired pie turned out not to be so bad after all. …Who knew? This entry was posted in Cooking, Entertainment, Recipes, Trial & Error and tagged cooking, entertainment, mistakes, recipes, trial & error. Bookmark the permalink.